Troops in the Democratic Republic of Congo blocked entry to a stadium where the main opposition leader planned to inaugurate himself as president. Etienne Tshisekedi has rejected the official victory of incumbent President Joseph Kabila in November's elections. 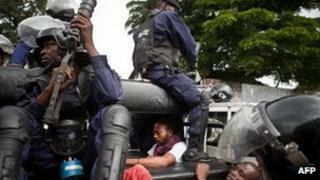 A BBC reporter says police used stun grenades to disperse people attempting to get to the stadium in the capital. So Mr Tshisekedi's conducted the unofficial inauguration at his home residence instead. President Kabila was sworn in for a second term on Tuesday after being declared the official winner with 49% of the vote, compared to Mr Tshisekedi's 32%. Western observers denounced the presidential results as seriously flawed, but the election commission - backed by the African Union - hailed the polls a success. The US-based campaign group Human Rights Watch (HRW) says police have killed at least 24 people since the disputed polls. On Thursday, Mr Tshisekedi's Union for Democracy and Social Progress (UDPS) party sent out what appeared to be official invitations on presidential letterheads, urging journalists and diplomats to attend the swearing-in ceremony at the Martyrs Stadium in the capital, Kinshasa, on Friday morning. But the BBC's Thomas Hubert in Kinshasa says he was refused entry to the stadium and all the roads around Mr Tshisekedi's residence have been cordoned off. According to the AFP news agency, police used tear gas to disperse opposition supporters gathered around the house, where Mr Tshisekedi later held his swearing-in ceremony. Troops from the police, military and Mr Kabila's elite Republican Guard have all been deployed around stadium in Kinshasa, which is an opposition stronghold, our correspondent says. Tanks, water cannon and soldiers armed with machine guns and rocket-propelled grenades could also be seen. The police fired stun grenades and made some arrests as people walked towards the stadium and the Republican Guard confiscated the BBC's recording equipment, our reporter said. Diplomats have been encouraging dialogue over the disputed poll, but dozens of people have died in clashes in Kinshasa and other opposition strongholds since election day. November's polls were the second in DR Congo since the 1998-2003 war, which claimed an estimated four million lives. On Thursday, the election commission halted the counting of votes from the parliamentary poll, saying it needed international help to complete counting following allegations of rigging. Mr Tshisekedi, who is popular in the west of the country, led the campaign for democracy under former leader Mobutu Sese Seko but these were the first elections he has contested. He boycotted the last poll in 2006, organised under the auspices of the United Nations, after claiming they had been rigged in advance. They were marred by weeks of street battles led by supporters of the losing candidate, Jean-Pierre Bemba. He is now on trial at the International Criminal Court for alleged war crimes in neighbouring Central African Republic. DR Congo is two-thirds the size of Western Europe but hardly has any infrastructure, such as roads and electricity. The Democratic Republic of Congo covers 2,344,858 square km of land in the centre of Africa, making it the 12th largest country in the world. Eastern DR Congo is awash with a variety of different rebel groups – some have come from neighbouring countries, while others have formed as self-defence groups. Many are taking advantage of the lack of a strong state to seize control of the area's mineral riches. DR Congo has abundant mineral wealth. It has more than 70% of the world's coltan, used to make vital components of mobile phones, 30% of the planet's diamond reserves and vast deposits of cobalt, copper and bauxite. This wealth however has attracted looters and fuelled the country's civil war. Despite the country's size, transport infrastructure is very poor. Of 153,497km of roads, only 2,794km are paved. There are around 4,000 km of railways but much is narrow-gauge track and in poor condition. Waterways are vital to transport goods but journeys can take months to complete. Overcrowded boats frequently capsize, while DR Congo has more plane crashes than any other country. With an estimated population of 71 million, DR Congo is the fourth most populous country in Africa. Some 35% of the population live in cities and the capital Kinshasa is by far the largest, with more than 8 million inhabitants. DR Congo has around 200 ethnic identities with the majority of people belonging to the Kongo, Luba and Mongo groups. Given its size and resources DR Congo should be a prosperous country, but years of war, corruption and economic mismanagement have left it desperately poor. In 2011 it lags far behind in many key development indicators, with average life expectancy increasing by only 2 years since 1980, after a period when it actually fell during the mid 1990s.